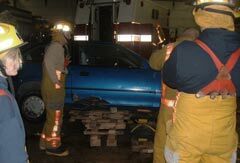 Training, like membership, is a critical component of any volunteer fire department. Historically the AVFD has always put an emphasis on training and that emphasis is greater today than ever before. We know that when we train, we train for our own safety as well as yours. It’s a fact, that the nature of incidents that the Fire and Emergency Medical Services must respond to has continued to increase in variety and complexity, and while technology in the form of equipment has improved as well, it is still your friends and neighbors that volunteer to go into harm’s way. It is their training that allows them to do this with the least amount of risk to themselves or you and with the greatest opportunity for helping those in need. While nationally all operational volunteer fire department members receive some form of training, either in a formal or informal setting, the minimum level of training depends on the state and regulatory authority. The AVFD prides itself in far exceeding the NYS Training requirements. In addition to our basic monthly drills, many of our members participate in higher qualification specialty roles requiring additional training, such as EMT (Emergency Medical Technician) and High Angle Rescue. So when you see your neighbors in the AVFD out training, know that it is with your safety in mind. Copyright © 2019 Aurora Volunteer Fire Department. Website design by Website Solutions of CNY.